Bets placed on Sport will not count towards your wagering requirement for your casino bonus. If player place bets on sport before the wagering requirements for the casino bonus have been met, we reserve the right to withhold any amount in excess of a player's original deposit from a player's withdrawal. All Goliathcasino's offers and bonuses are intended for recreational players only, accordingly, any activity which unfairly exploits or manipulates one or more bonuses or promotions offered by Goliathcasino, is strictly forbidden. A list of the activities which fall within these prohibited types of play is set out below: common betting patterns across identical events; markets or selections that could be identified in one or across several accounts; placing bets on all likely outcomes of an event or any other apparent relation between players; which results in guaranteed player profits irrespective of the outcome (“Prohibited Play”). In case where a player or a group of players engage(s) in Prohibited Play in respect of a promotion, Goliathcasino may, in its sole discretion: (i) limit the eligibility of those player(s) to participate in the relevant promotion; (ii) amend the terms of any bonus or offer; (iii) cancel and forfeit that player's or that group of players' offer, bonus eligibility, bonus amount and any associated bonus winnings at any time in respect of that promotion; (iv) settle bets at the correct odds; [and/or] (v) charge an administration cost on the player up to the value of the deposit bonus, free bet, risk free bet or additional payment to cover administrative costs incurred by Goliathcasino with respect to any breach of these Sports Bonus Terms to a reasonable level. Where Goliathcasino has taken a decision that a player is to lose an entitlement to any bonus or bonus winnings following any Prohibited Play, Goliathcasino shall provide the player with an explanation of the relevant Prohibited Play in which the player has been engaged. Goliathcasino may, from time to time, offer promotions and/or competitions which are governed by separate terms and conditions. Any promotions, bonuses or special gifts credited to your account must be used in adherence with such terms and conditions. Goliathcasino may cancel, amend or modify any promotion, competition, bonus or special offer by publishing the amended or modified terms or notice of cancellation on the relevant internet page of the promotion, competition or special offer. Such amendment, modification or cancellation shall take effect following the expiry of a period of 14 days of such publication, or with immediate effect, where required for security reasons, to comply with applicable law or regulation, due to abuse or otherwise where the promotion, competition or special offer is not capable of being conducted as specified as a result of exceptional circumstances. 1st deposit: 100% Bonus up to $200. 3rd deposit: 50% Bonus up to $200. 4th deposit: 100% Bonus up to $200. 5th deposit: 25% Bonus up to $400. This bonus only applies for deposits of $20 or higher! the welcome offer not valid to players residing in United Kingdom or Germany. 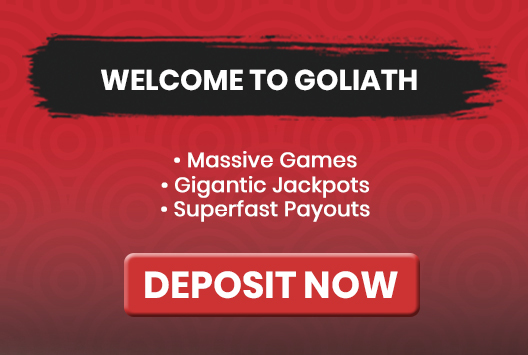 All you need to do is just deposit the money in your Goliathcasino account and you will receive this bonus instantly! The "Welcome bonus" is limited to one bonus per household. Aspire Global operates a number of casino brands ("Aspire Global's brands") and reserves the right to limit the number of Welcome Bonuses that may be taken up by a player across Aspire Global's brands in the following way. By claiming this welcome bonus offer at Goliathcasino , you are prohibited from claiming a welcome bonus at other Aspire Global's brands. Any attempt to try to deceive management by registering multiple accounts within Aspire Global's brands in order to gain bonus money, may be deemed as bonus abuse and may result in the account(s) being suspended and the removal of your funds. For list of Aspire Global brands click here. The "Welcome bonus" must be wagered at Goliathcasino within 21 days of being credited to your account. Goliathcasino reserves the right, at any time, to revoke any welcome bonus not used within the allotted time period. All of Goliathcasino's bonuses and winnings may only be cashed out after you have made at least one approved deposit and you have wagered at least 35 times (unless stated otherwise) of each bonus received – for example you must wager $350 before cashing out if you have received a bonus of $10. When a bet abuses the betting system – regardless of which game it was placed on – it will not count towards a player’s wagering requirements. If the player placed single bets equal to or greater than $4 or $0.50 per line or 15 percent of the bonus amount before the wagering requirements for the bonus have been met, we reserve the right to withhold any amount in excess of the player’s original deposit from a player’s withdrawal.In addition, if a player deposited with Skrill or Neteller and placed single bets equal to or greater than $2.50 of the bonus amount before the wagering requirements for the bonus have been met, we reserve the right to withhold any amount in excess of the player’s original deposit from a player’s withdrawal. Additional Bonuses are issued in good faith by Goliathcasino as an incentive for players, or as a token of appreciation for returning players who have continually shown their patronage. They are only intended for players who use the Goliathcasino website for fun or entertainment purposes and will be denied, declined, or retracted from players who abuse the spirit of this offer. Further requirements may be set, according to the type of bonuses. No promotional or other type of bonus will be issued or allowed once money has been cashed out and is in the players pending account. This will remain until that cashout has been either approved or cancelled and the pending account has a zero balance. The aforementioned clause will also apply should there still be an available balance in the player’s active Goliathcasino account. Goliathcasino reserves the right to remove prize credits from the accounts, or deny a cashout request, of any players who fail to comply with any of the above conditions. In the event of a dispute, Goliathcasino's decision is final and not subject to appeal. Single Bets placed at odds of less than 1.50 (1/2) will not count towards any Rollover Requirements, unless expressly stated. In addition, with respect of Combo Bets or System Bets, at least one selection must have odds of 1.50 (1/2) or greater to count towards the Rollover Requirements, unless expressly stated. Only the first selection bets in any market, both In-Play and pre-match, shall count towards the Rollover Requirements. Any other selections following bets placed in the same market shall not count towards the Rollover Requirements. This provision applies in conjunction with the other restrictions. By way of example only, once you have placed a bet on Team A to beat Team B on the Full Time Result market at odds of 1.50 (1/2) or greater will count towards the Rollover Requirements, however a following bet placed on Team B on the Full Time Result market in the same game either pre-match or In-Play will not count towards the Rollover Requirements. Bets will only count towards Rollover Requirement once they have been finally settled. In case where players transfer funds from their Sports Cash Account to their Casino Cash Account and the amount of such funds is not thereafter wagered at least twice before being transferred back to the Player’s Sports Cash Account, Goliathcasino may confiscate such funds, if such transfer patterns are deemed, at our sole discretion, as irregular gameplay and/or bonus manipulation or abuse. A free bet stake will not be included in any winnings and it cannot be exchanged for real money or any other bonuses. Unless specifically stated otherwise, any winnings earned from a free bet shall be credited to the player’s account, and can be withdrawn right away. A free bet shall only be valid on specified bet types, sports, leagues, markets or events – all as stated in the specific promotion terms. If a bet which contributed to the eligibility of a free bet has been cancelled, Goliathcasino reserves the right to remove such free bet from the player’s account and shall, at its sole discretion, determine whether the player may be eligible for the promotion. If a bet contributing to the eligibility of a free bet and a bet placed with that free bet is covering opposite selections of the same event, then any winnings shall be cancelled and forfeited by us. Combo and System Bets, regardless of the number of individual bets placed, may contribute to the eligibility requirement for only one free bet. For example, if a player places three singles, as one bet, then such singles shall contribute to the eligibility requirement for only one free bet. Further, if a player places a system of three doubles and one treble bet, these bets shall contribute to the eligibility requirement for only one free bet. Unless otherwise specified, any bets placed shall first contribute to the eligibility requirements of a free bet, before contributing to the eligibility requirement of any other promotional offer. Any bets which have contributed to the eligibility requirement for a free bet shall not contribute to the eligibility requirement of any other promotional offer. Except for Sports, free bets cannot be used on any other online product, such as, Casino, Live Casino, Slots, etc. Any bet that satisfies the eligibility requirement to be awarded a Free Bet may not later be the subject to a Cash function. Unless stated otherwise by Goliathcasino.com, Free bet tokens must be used within 30 days of being credited to the player account. Players can redeem their free bet token through the Website. A free bet cannot be split. If you choose not to use the full amount of your free bet, the remaining amount will be forfeited. For example, if a $10 Free Bet is used for a $5 bet, then the unused $5 shall be forfeited. Free bets do not count towards rollover requirements for any other bonuses or offers. Unless specifically stated otherwise, any winnings earned from a risk free bet shall be credited to the player’s account, and can be withdrawn right away. Unless specifically stated otherwise, any stake back from a losing risk free bet shall be credited to the player’s account, and can be withdrawn right away. A Risk Free Bet shall only be valid on specified bet types, sports, leagues, markets or events – all as stated in the specific promotion terms. If a bet which contributed to the eligibility of a risk free bet has been cancelled, Goliathcasino reserves the right to remove such free bet from the player’s account and shall, at its sole discretion, determine whether the player may be eligible for the promotion. If a bet contributing to the eligibility of a risk free bet and a bet placed with that risk free bet is covering opposite selections of the same event, then any winnings shall be cancelled and forfeited by us. Combo and System Bets, regardless of the number of individual bets placed, may contribute to the eligibility requirement for only one risk free bet. For example, if a player places three singles, as one bet, then such singles shall contribute to the eligibility requirement for only one risk free bet. Further, if a player places a system of three doubles and one treble bet, these bets shall contribute to the eligibility requirement for only one risk free bet. Unless otherwise specified, any bets placed shall first contribute to the eligibility requirements of a risk free bet, before contributing to the eligibility requirement of any other promotional offer. Any bets which have contributed to the eligibility requirement for a risk free bet shall not contribute to the eligibility requirement of any other promotional offer. Except for Sports, risk free bets cannot be used on any other online product, such as, Casino, Live Casino, Slots, etc. Any bet that satisfies the eligibility requirement to be awarded a risk free bet may not later be the subject to a Cash function. Any bet the subject of a Cash-Out shall not contribute to any eligibility requirement to receive a risk free bet. Bets placed on Asian Handicap or Over/Under, and are half-lost, shall not count towards the eligibility requirements of a risk free bet, when such conditions are considered for lost bets only or for missed selections in an accumulator. Unless stated otherwise by Goliathcasino, risk free bet tokens must be used within 30 days of being credited to the player account. Players can redeem their risk free bet token through the Website. A risk free bet cannot be split. If you choose not to use the full amount of your risk free bet, the remaining amount will be forfeited. For example, if a $10 Free Bet is used for a $5 bet, then the unused $5 shall be forfeited. Risk free bets do not count towards rollover requirements for any other bonuses or offers. Goliathcasino is committed to "CARE" - Customers Are Really Everything. We have implemented a professional customer support team ready to assist you 7 days a week from 8am to 1am CET. Please do not hesitate to contact the Goliathcasino team. Just click on Contact Us. Bets placed on the sport product or any roulette game will not count towards your wagering requirement for your casino bonus. Bets placed on the casino products will not count towards your wagering requirement for your sport bonus. A Free Bet Token may not be (i) combined with another Free Bet Token or Risk Free Bet; or (ii) transferred by a player to another player. Free Bet Tokens must be used within 30 days of being credited to the player account. Unused Free Bet Tokens will be removed from the player account after this period. Free Bet Tokens do not count towards any wagering requirements. A Free Bet Token cannot be split. If you choose not to use the full amount of your Free Bet Token, the remaining amount will be forfeited by you. For example, if a $10 Free Bet is used for a $5 bet, then the unused $5 of the Free Bet Token shall be forfeited. The value of the Free Bet Token will not be included in any winnings derived from use of the Free Bet Token. Unless specifically stated otherwise, any winnings earned from a Free Bet Token will be credited to your player account, and is available for cash out in accordance with our Withdrawal policy. A Free Bet Token shall only be available for use on specified bet types, sports, leagues, markets or events – all as stated in the specific Promotion Terms or on the website. If you make a bet which contributes to your eligibility to receive a Free Bet has been cancelled, we shall remove such Free Bet from your player account. If you make a bet which contributes to your eligibility to receive a Free Bet Token and the bet placed with such Free Bet Token is covering opposite selections of the same event, then any winnings generated by the Free Bet Token shall be cancelled. Combo and System Bets, regardless of the number of individual bets placed, may contribute to the eligibility requirement for only one Free Bet Token. For example, if you place three singles, as one bet, then such singles shall contribute to the eligibility requirement for only one Free Bet Token. Furthermore, if you place a system of three doubles and one treble bet, these bets shall contribute to the eligibility requirement for only one Free Bet Token. Unless otherwise specified, any bet placed shall first contribute to the eligibility requirements of a Free Bet Token, before contributing to the eligibility requirement of any other promotional offer. A Free Bet Token can only be used on the sports products. Any bet that satisfies the eligibility requirement to be awarded a Free Bet Token may not later be the subject to the Cash Out function which can be found here. Any bet which has been cashed-out shall not contribute to any eligibility requirement to receive a Free Bet Token. Bets placed on Asian Handicap or Over/Under, and are half-lost, shall not count towards the eligibility requirements of a Free Bet Token, when such conditions are considered for lost bets only or for missed selections in an accumulator. In order to use a Risk Free Bet Token you must have at least the equivalent amount of the amount wagered through the Free Bet Token in your real money balance. If you place bet, combining real money from your player account with a Risk Free Bet Token, you will receive the amount of the real money bet back if such bet loses. A Free Bet Token will not be included in any winnings and it cannot be exchanged for real money or any other bonus. A Risk Free Bet Token must be used within 30 days of being credited to the player account. Unused Free Bet Tokens will be removed from the player account after this period. A Free Bet Token cannot be split. If you choose not to use the full amount of your Free Bet Token, the remaining amount will be forfeited by you. For example, if a $10 Free Bet isused for a $5 bet, then the unused $5 of the Free Bet Token shall be forfeited. Unless specifically stated otherwise, any winnings earned from a Risk Free Bet Token will be credited to your player account and is available for cash out in accordance with our Withdrawal policy. Unless specifically stated otherwise, any stake back from a losing Risk Free Bet will be credited to your account, and is available for cash out in accordance with our Withdrawal policy. A Risk Free Bet Token shall only be available for use on, sports, leagues, markets or events – all as stated in the specific Promotion Terms. If a bet which contributed to the eligibility to receive a Risk Free Bet has been cancelled, we shall remove such Free Bet from your player account. If you make a bet which contributes to your eligibility to receive a Risk Free Bet and the bet placed with such Risk Free Bet Token is covering opposite selections of the same event, then any winnings generated by the Free Bet Token shall be cancelled. Combo and System Bets, regardless of the number of individual bets placed, may contribute to the eligibility requirement for only one Risk Free Bet Token. For example, if you place three singles, as one bet, then such singles shall contribute to the eligibility requirement for only one Risk Free Bet Token. Further,ore, if a you place a System of three doubles and one treble bet, these bets shall contribute to the eligibility requirement for only one Risk Free Bet Token. Unless otherwise specified, any bets placed shall first contribute to the eligibility requirements of a Risk Free Bet Token, before contributing to the eligibility requirement of any other promotional offer. A Risk Free Bet can only be used on sports products. Any bet that satisfies the eligibility requirement to be awarded a Risk Free Bet may not later be subject to the Cash Out function which can be found here. Any bet which has been cashed out shall not contribute to any eligibility requirement to receive a Risk Free Bet Token. Bets placed on Asian Handicap or Over/Under, and are half-lost, shall not count towards the eligibility requirements of a Risk Free Bet Token, when such conditions are considered for lost bets only or for missed selections in an accumulator.